Vocal on track 8 sampled from the movie 'D3: The Might Ducks' (1996). A masterpiece release in its genre. Absolutely alluring album. I think that even listeners outside of the Goa/Psy/Progressive trance genre can joy this, but possibly not to its full intended potential. 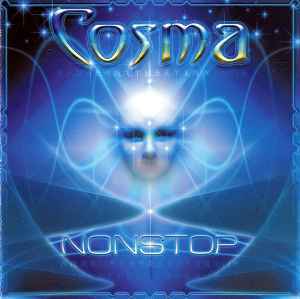 The whole album paints beautiful pictures and shapes on your mind with Cosma's timeless masterpiece. Cosma lives though his music. One can only imagine what his music would have been like had he have been alive today. This is a top shelf album and my absolute favourite for this genre. Rest assured, it's going to take something magical to move this one away from #1 in my collection! A lot of the time when an artist passes away prematurely, their work suddenly acquires a golden sheen and becomes way overrated as a result. Thankfully, that is definitely NOT the case here - this album really is a good as everyone says. 'Nonstop' pretty much picks up where the fantastic 'Simplicity' left off. Cosma breaks no new ground with this album, but in this case that is a good thing. Whenever 'Simplicity' ended I always wanted more, and then I got it. Instead, Cosma develops and refines what he began in his debut album, and the result is pure hypnotic aural beauty. Subtle melodies, satisfying basslines, somehow energetic and floaty at the same time, and the downtempo 'Ethno-Bialick' is truly one of the most stunning pieces of music I've heard. This album is a journey that any psytrance fan should make a point of experiencing. Avihen Livne (Cosma) surprised everybody with his debut album Simpilicity in 2001. He gave us something new and fresh from the Israeli scene. Crystal clear sound that was somewhere between scando trance and more typical Israeli trance. An album great for home listening, for your car drive or for partying, especially at sunrise. February 2003, we got the sad news that Cosma had passed away (only 23 years old) in a motorcycle accident in Goa, India on his vacation, just a few weeks before his second album Nonstop was going to be released. An album a lot of trance lovers out there had been looking forward to since the release of Simplicity two years earlier. Sadly the worlds trance scene has lost one of the most talented Israeli trance artists. In my opinion this album was better than the first Cosma album. He has made this album a bit darker and more full on than the first one. Here you get a beautiful chilled track, tracks for the morning and some dark night time music. Just about every psychedelic fanatic has heard this album, and for those that havent, have something wrong with them. When you get down to it, Cosma is simply 'just another melodic psy guy'. However, what seperates him from everybody else is the beauty in his music, especially this particular album. Gorgeous, emotional, melodies progress throughout every single track, leaving whomever is listening yearning for more the moment it ends. Each track has soul. Each track has life. Upon listening to this CD one is englufed in powerful, spiritually uplifting melodic music, pulling one to his or her feet, as if a Shiva like diety has taken over. It's impossible to describe this music in words, it can only be appreciated by hearing it. I'm second guessing even writing this, as it's impossible to say in text what it is like. It's one of the rare gems that define psychedelic music as what it is today, to some extent (some may disagree totally). The music just captivates you, sucking you into a literal trance, or a meditative state. That's exactly what it is. A meditative experiance via music and dance. Sadly, though, Avihen Livne passed away while visiting Goa, just before completing this album. So, this CD was released by the labels decision, despite his passing, as a memory. His name has since lived on and has entered its place in psychedelic history. To quote a line directly from Cosma: "I'm in love with the music. I hope I can live like this for the rest of my life." May his music live on, inspiring and introducing future generations of psychedelic trance fans. This is Avihen Livne's last album as he died this year in a traffic accident in India. Respect to one of the greatest musicians in the psytrance genre.